Everyone loves home-baked sweet treats, but not everyone has the time or budget to bake the complex recipes so often found in mainstream baking cookbooks or on baking websites. Jennifer McHenry, creator of the popular baking blog BakeorBreak.com, has the solution with recipes that are easy, affordable and delicious, such as Chocolate Chip Cream Cheese Blondies using 2 ingredients, Lemon Ginger Scones using 3 ingredients and Mini Chocolate Pound Cakes with Butterscotch Frosting using 4 ingredients. With fewer ingredients, shopping is a breeze and readers will save money. The book is organized into chapters by ingredient count and features a "From the Grocer" guide at the top of each recipe, making grocery shopping easy as pie. 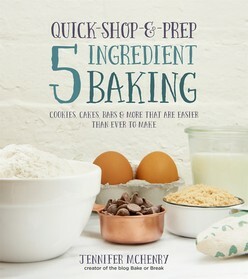 Jennifer has packed the book with 80 amazing, mouth-watering recipes for cookies, cakes, pastries and breads that are simple and budget-friendly. Bake delicious treats and desserts from scratch with recipes that are simple, affordable and require only 2, 3, 4 or 5 main ingredients.